A delicious vegetable and chicken stir fry recipe is one of the most popular Chinese food recipes to make at home. 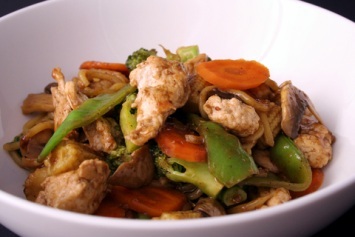 If you are looking for tasty diabetic recipes and heart healthy recipes our chicken stir fry recipe is great. Cut chicken into cubes. Place the chicken in a bowl and add 1 teaspoon of the oil, 1 tablespoon soy sauce and 1/2 teaspoon cornstarch. Toss to coat chicken. In a small bowl, combine broth, red pepper flakes and remaining soy sauce and cornstarch. In a large skillet, heat 1 tablespoon oil over medium-high heat. Add chicken. Stir-fry for 2 to 3 minutes or until chicken is opaque. Transfer chicken to plate. Add remaining oil, pepper, onion, broccoli, garlic and stir fry until onion starts to wilt. Add water chestnuts and chicken. Add broth mixture and bring to a boil. Cook, stirring constantly until the vegetables are tender-crisp, the chicken is done and the sauce has thickened a bit. Varying the vegetables you use makes this a versatile recipe that you will never get tired of. Use Chinese Napa cabbage, bok choy, mushrooms or any other vegetable you think might taste good. Give it a try and you may come up with something even tastier. Low Carb: Obviously if you are doing a low carb diet or diabetes diet recipe, you won’t serve this stir fry with rice. It tastes great on it’s own. I often steam or stir fry another vegetable just by itself and add a bit of soy sauce to it for flavor. My favorite is a side of steamed bok choy or asparagus with a touch of soy sauce and a drop of sesame oil added for extra flavor. Yum! To make this recipe gluten free, make sure your soy sauce is a gluten free brand. This recipe is very healthy. It’s also easy, tasty and fits into so many healthy diet programs. If you are looking for very low fat recipes, I would suggest marinating the chicken in the soy sauce only and leave out that second tablespoon of oil. Of course you can use cooking spray and leave out all of the oil, but a bit of healthy cooking oil is good for you and it does add lots of taste. For a completely gluten free recipe, make sure your soy sauce is gluten free. Many are not. If you like our Chicken Stir Fry recipe, you’ll want to try our Chinese Broccoli Beef Recipe too. You will find it here.